Muscatine has an excellent blend of financial institutions that are ready and able to meet the needs of your projects. In addition, the Greater Muscatine Chamber of Commerce & Industry manages an Industrial Revolving Loan Fund for eligible projects. This fund provides low interest loan money for economic development projects up to a maximum loan of $50,000. 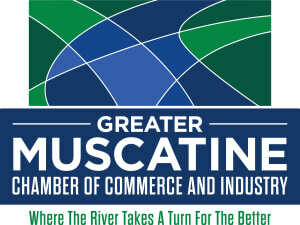 The Greater Muscatine Chamber of Commerce and Industry will consider a loan for your project depending upon the complete and final information submitted regarding the proposed project and due diligence. The Bi-State Revolving Loan Fund program targets businesses that cannot obtain full financing because of conventional interest rates and lending/exposure limits applied by local lending institutions. It is intended to provide the funds that complete the financial package by financing the 'gap' created by these conditions. The program offers low interest loans to industrial, commercial, light manufacturing, retail and service industries for expansion and development purposes. Funds can be used towards the purchase of fixed assets (land, building and equipment) and for working capital purposes. More information about this program can be found Here.